The nation's most prominent news programs found little time to discuss gun policy and solutions to gun violence while covering the deadliest shooting in modern U.S. history, and what little discussion they did have disproportionately featured Republicans with ties to the gun industry. Media Matters analyzed evening news shows and Sunday political talk shows on CBS, NBC, and ABC between October 2 and October 22 that included discussion of the October 1 Las Vegas, NV, massacre and found that conversations about how to solve gun violence -- via policy or other means -- were few in number and quickly tapered off in the days following the shooting. During the limited gun policy discussions, the shows hosted and quoted Republican officials who have received much more money from the gun lobby than their pro-gun-safety Democratic counterparts. Conservative media and their gun lobby allies often respond to mass shootings by saying that the immediate aftermath of the event is not the time to talk about solutions to gun violence. 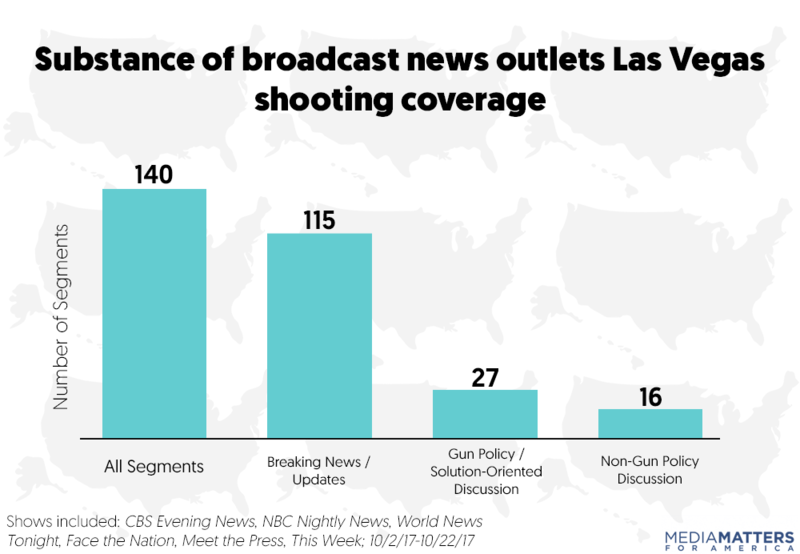 Overall coverage of the Las Vegas massacre appears to follow that advice, as the vast majority focused on breaking news and updates, with only 19 percent even mentioning gun policy and solutions. 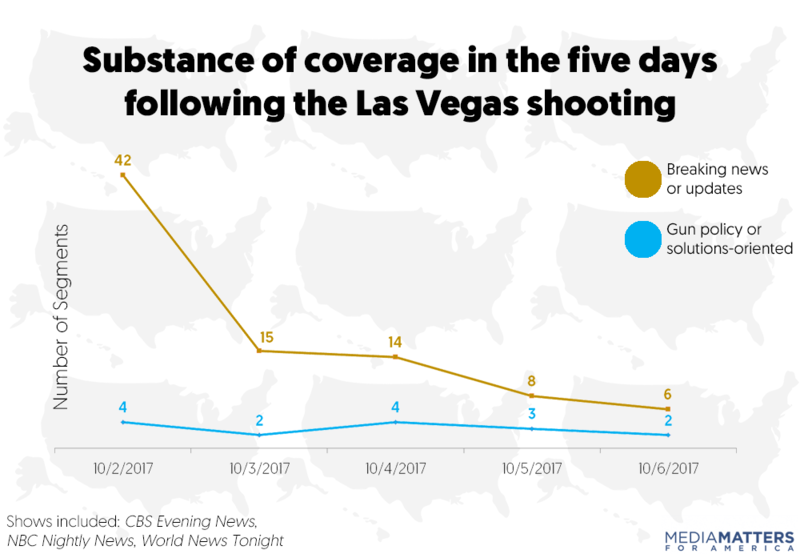 The entirety of the coverage -- including breaking news and updates on the incident, gun policy and solutions-oriented discussions, and non-gun-policy discussions related to the shooting -- was largely contained to the immediate aftermath of the shooting, with 83 percent taking place in the first week of the study period. As the drastic drop in coverage during our analysis indicates, there is no period “appropriately” removed from a high-profile incident of gun violence when a gun debate actually takes place. None of the segments analyzed from October 8 through the end of the study period on October 22 included gun policy and solutions-oriented discussion. Coverage of the shooting dramatically dropped following a week of heavy reporting. The vast majority of segments on the shooting were devoted to breaking news and updates and not solutions-oriented gun policy discussion -- even during the period immediately following the shooting, which would have been the best opportunity to have a policy debate at a time when coverage dominated the news. Much of the discussion around gun policy occurred on a single day. CBS led other broadcast networks in airing segments about gun policy. 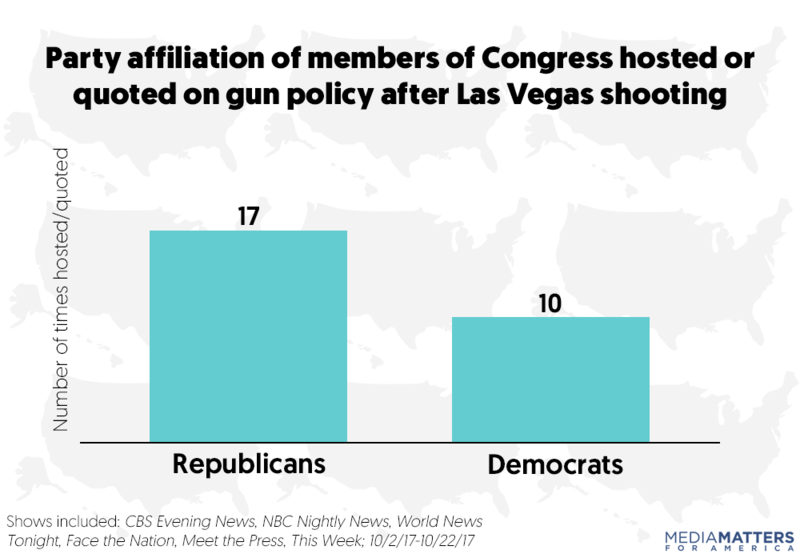 Shows hosted or quoted Republican members of Congress -- who have received large sums of money from the gun lobby -- more often than Democrats during gun policy discussions. CBS Evening News, NBC Nightly News, ABC’s World News Tonight, and the networks' Sunday political talk shows -- CBS’ Face the Nation, NBC’s Meet the Press, and ABC’s This Week -- ran a total of 140 segments on the shooting between October 2 and October 22. 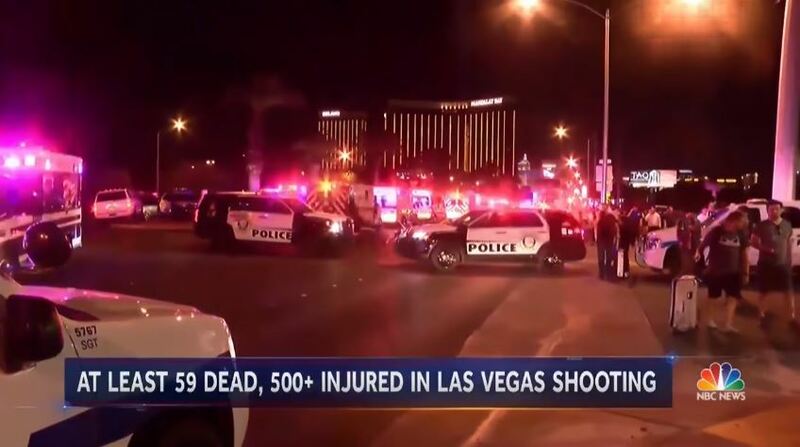 Forty-six segments were broadcast on the day after the shooting, October 2, when broadcasts networks extended their normal show hours to run additional segments. 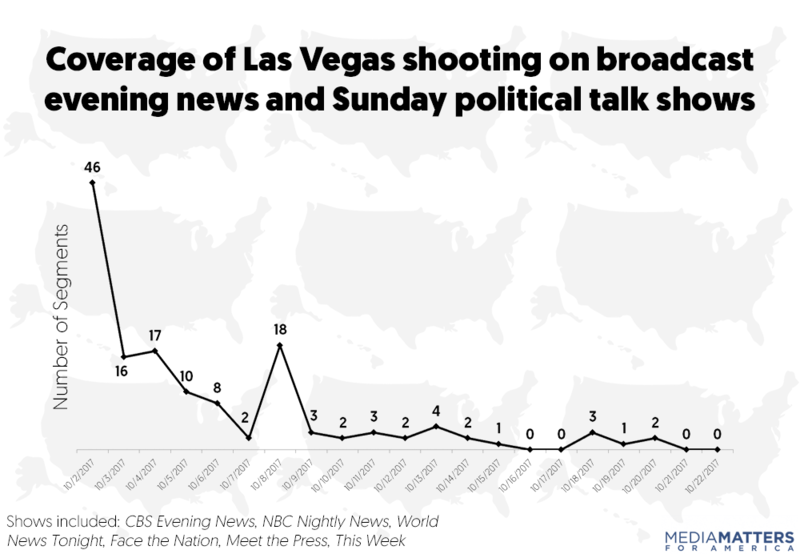 The shooting received heavy, but declining, coverage in subsequent days, and then briefly spiked on October 8 when segments on Sunday political talk shows helped to bring the total number for that day to 18. After October 8, coverage fell off. Political talk shows on October 15 and October 22 included no segments on the shooting, and coverage on evening news programs tapered off. Broken down by week, 83 percent of segments occurred during the initial week following the shooting (October 2-8), 12 percent came the following week (October 9-15), and 4 percent of segments occurred in the final week of the study (October 16-22). 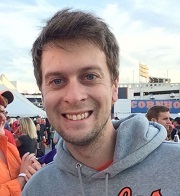 Our analysis also sought to determine the substance of segments run on the shooting. While broadcast news programs’ stature gives them the authority to set an agenda for what topics will be covered long term, they do have limited time and must move forward with reporting on new topics. Given those constraints, we wanted to analyze how the programs used the time they had; to do so, we coded three common occurrences in segments: breaking news and updates on the Las Vegas shooting, gun policy discussions, and non-gun policy discussions. The first category included reports on the facts of the shooting -- the who, what, when, where, and why -- and often included updates about the perpetrator, the victims, the timeline, and the weaponry that was used. Gun policy and solutions-oriented discussions typically included segments about the prospect of legislative action to address the massacre, but non-policy discussion of solutions to gun violence were also included. Finally, non-gun policy discussions included segments that discussed policy changes in the wake of the shooting that were unrelated to the regulation of firearms -- for example, segments that covered mental health policies or non-gun-related security screening measures to prevent mass shootings. During the period when the shooting was receiving the most coverage, gun policy and solutions-oriented discussion was largely drowned out by other types of coverage. In the first five days of coverage following the shooting -- Monday, October 2, through Friday, October 6 -- segments were far more likely to focus on breaking news and updates than gun policy or solutions-oriented discussion. 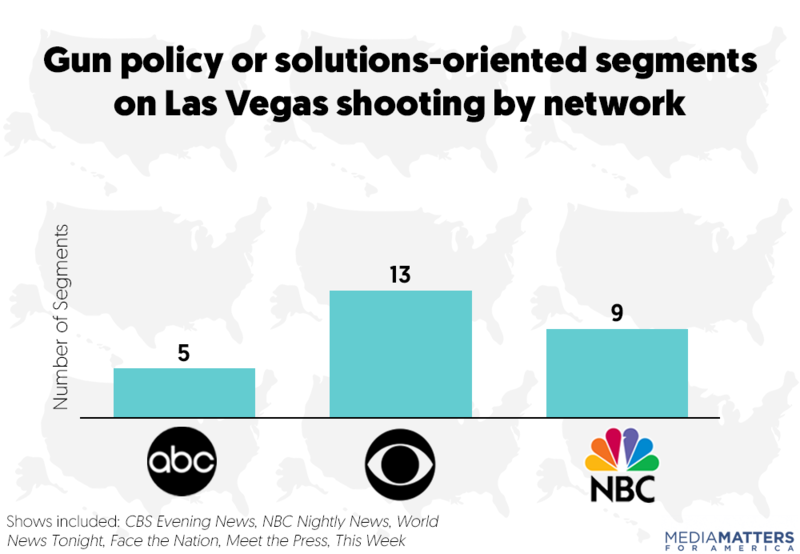 Given the later overall drop in coverage of all types on the shooting, this would have been the time to have a rigorous debate over policy and solutions. But that didn’t happen. During this week, 15 segments included gun policy and solutions-oriented discussion, while 85 contained breaking news or updates. Of the 140 segments in the entire study period, 115 (82 percent) included breaking news or updates, 27 (19 percent) included gun policy and solutions-oriented discussion, and 16 (11 percent) included non-gun policy discussion. Some segments fell into more than one category, i.e. a segment that provided updates on the timeline of the shooting that also included discussion of legislative proposals to prevent further massacres. 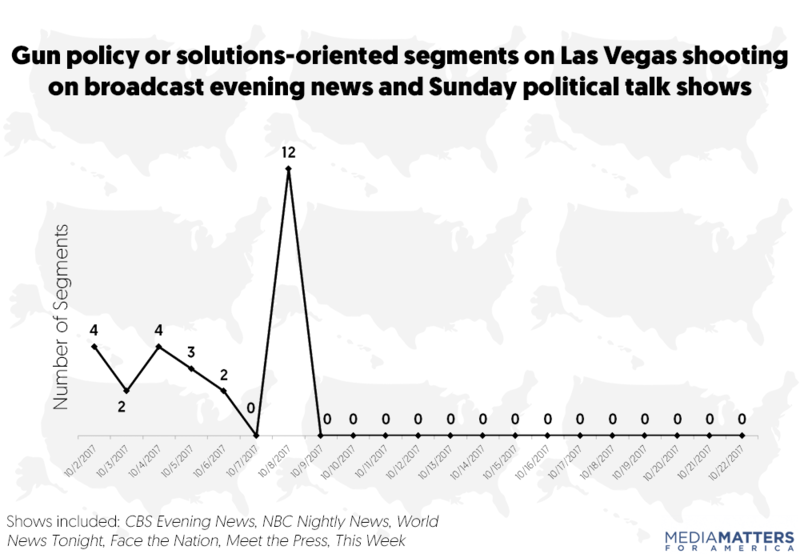 Gun policy and solutions-oriented discussions spiked on the Sunday following the shooting, when all three Sunday shows included in the study ran multiple segments that met our criteria. That day featured 12 segments on gun policy and solutions-oriented discussion, representing 44 percent of total segments meeting that criteria. But then the discussion of what should change following the worst mass shooting in modern U.S. history was over: Between October 9 and October 22, zero segments included gun policy and solutions-oriented discussion, a time period when the programming missed an opportunity to continue the conversation. Of the 27 segments that included gun policy and solutions-oriented discussion, nearly half occurred on CBS. NBC and ABC accounted for the other 14 segments. These segments typically focused on questions about banning or otherwise regulating bump fire stocks -- a firearm device the Las Vegas gunman used to rapidly accelerate his gunfire. Based on a review of transcripts, it is likely that the overrepresentation of Republican lawmakers was due to reports that Republicans were open to regulating the devices, a concession rarely seen from Republicans on gun policy. But since those initial reports on Republicans’ supposed willingness to take action, the waters have become significantly muddied. Republicans have the numbers in Congress to quickly move legislation banning the devices, but they have chosen not to do so. (A hearing that will include testimony on bump fire stocks will take place this week, but that is no guarantee legislation will pass or even be advanced.) House Speaker Paul Ryan (R-WI) made statements on October 11 that further cast doubt on the idea that Republicans are serious about passing bump fire legislation. During a press conference that day, Ryan advanced the position of the National Rifle Association, which is that the Bureau of Alcohol, Tobacco, and Firearms (ATF) should regulate bump fire stocks. (Ryan received $171,977 from the gun lobby during the 2016 election cycle, more than double any other U.S. representative.) The ATF, however, does not have the authority to regulate the devices because it hasn’t been granted the agency by Congress. Ryan and the NRA’s position is really just a gambit that allows them to appear conciliatory in the face of public outcry while actually preserving the status quo. Ryan’s claims were just a portion of several developments that could have warranted further segments on gun policy, but as previously noted, segments that included gun policy and solutions-oriented discussion were nonexistent after October 8. Beyond not adequately discussing gun policy, the shows also failed to invite guests with expertise on the issue during the period of our analysis. The shows examined hosted just one gun violence researcher -- Dr. Daniel Webster of the Johns Hopkins Center for Gun Policy and Research -- during the study period. Media Matters searched Nexis transcripts for CBS Evening News, Face the Nation, NBC Nightly News, Meet the Press, World News Tonight, This Week between the dates of October 2 and October 22 for the terms “gun” or “firearm” or “shooting” or “domestic violence” or “suicide” or the word “accident” within five words of the word “gun” or “hate crime” or “officer involved” or “police shooting” or “shot” or “massacre” or “Las Vegas.” We counted segments that fit our criteria, omitting teasers and headlines. We downloaded transcripts for these search results and analyzed them. To determine what the substance of segments on gun violence was, we split segments into three categories. The first category is segments that reported on the facts of the shooting -- the who, what, when, where details, including but not limited to reports on victims, perpetrators, how the shooting was carried out, the location of the shooting, and what firearms were used in the shooting. Second, we coded for segments that included policy or solutions-based discussion. The final substance category we coded for was non-gun-related policy discussions during segments that we coded as coverage of the Las Vegas shooting, such as when mental health policy was discussed. For segments that included policy or solutions-based discussion, we coded members of Congress by their party affiliation when they were hosted as guests or quoted on the topic. Segments that quoted members of Congress discussing only news updates about the shooting were not included in this count. We also coded for guests' professional affiliations during policy segments.